We haven’t seen Andy Serkis onscreen in the flesh since 2015, but the performance-capture master is finally back sans mo-cap suit in Black Panther. Reprising the villainous Ulysses Klaue from Avengers: Age of Ultron, Serkis’ South African arms dealer comes face-to-face with the King of Wakanda in Ryan Coogler’s new film. “It was certainly fun to get into Klaue, and feel my way through it with more stimuli than perhaps you get wearing a performance-capture suit,” Serkis told me over the phone. In Black Panther, Serkis sports an arm cannon made of vibranium and teams up with Michael B. Jordan’s Erik Killmonger. After Klaue steals a precious piece of Wakandan history from a museum, he becomes a top priority for Chadwick Boseman’s T’Challa. 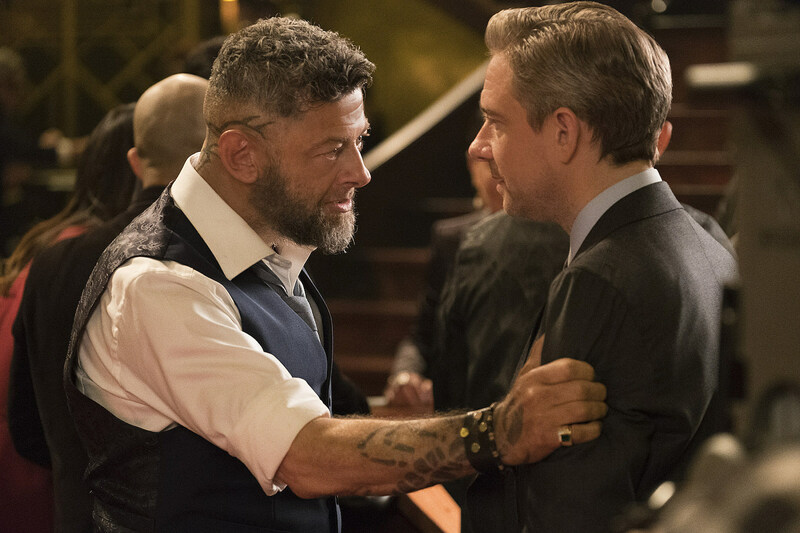 I caught up with Serkis to talk about his return to the MCU, the importance of Black Panther‘s political message, and to try to snag a few updates on his other potential projects. Like: Will his Gollum return for Amazon’s Lord of the Rings‘ TV series? (Sadly, it doesn’t look likely.) Will that Tintin sequel ever happen? I also asked Serkis about War for the Planet of the Apes‘ minimal awards recognition, and whether he thinks the Oscars will ever honor motion-capture performances. We haven’t seen Klaue since Age of Ultron. What was the most exciting part about returning to the MCU for Black Panther for you? Just coming into this story, which I just love. And obviously in the comics, he is the major adversary for T’Challa and the Black Panther. So I knew that it was, at some point down the line, going to be coming my way. I just loved what Ryan did with it in the script. I think he made him a really interesting and morally ambiguous villain. He is one of the world’s greatest takers. He steals, he consumes, he doesn’t have empathy for anyone, he doesn’t care about anyone but himself. He is a total lone wolf. But at the same time, Ryan also gave him this offbeat sense of humor and sort of quirkiness, which kind of came out of Ultron, actually, which Joss Whedon had started and Ryan took it to another level. It was really exciting and fun to play. Are you a big fan of the Black Panther comics? I wasn’t a huge fan of such. I do remember them and also dove into them once I knew I was playing Klaue. But it wasn’t something I grew up particularly with. But I love the world of the Black Panther and Wakanda, and actually Ulysses Klaue’s backstory is this sort of South African Boer character. In a lot of ways this doesn’t feel like a typical Marvel movie; there’s a strong political theme and a focus on identity. Considering that, did working on this feel any different than playing Klaue in Ultron? Yeah, I mean just the sense that it has been this highly anticipated movie that does, for the first time, have an African or African-American superhero at the center of it, and is very much a story that we have not seen, that is culturally really important and will have far-reaching consequences. I do think that we were all aware when we were making it that this is going to be a bit of a sea change I think, and part of a bigger movement, hopefully. And it fits into, I think, a current worldview – which I see happening with blockbuster movies – where you are part of this grand entertainment, but also they are becoming our modern-day myths and parables. So that you can talk about the human condition and you can say political things through grand entertainment. But yet, still have humor in it and great characters and great stories. One of my favorite parts of this is the casino fight. There’s a long tracking shot through that sequence and tons of fight choreography. What was that like to film that with Ryan? It was amazing. It was a real challenge and it was split up into lots of pieces. It was split up into about five or six sequences actually, which we choreographed and worked and rehearsed. And then it is all a matter of timing in the moment. There’s a precision to it, but then making it look like it’s chaos, sort of choreographed chaos, which is great to work on as an actor. These long takes, making them really feel like they’re coming alive was really, really challenging and really good fun to do. It’s also great to see you in the flesh here. I feel like it’s been forever since you’ve been outside a motion-capture suit. Yeah! And as you probably know and I think I’ve said publicly many times, I’ve never really drawn a distinction between being in the flesh and being in a motion-capture suit, in terms of acting. But it was certainly fun to get into Klaue and have his tattoos and have the head shaved and get into the costume and makeup of it all, and feel my way through it with more stimuli than perhaps you get wearing a performance-capture suit. So I loved it. It was liberating in a different way, I guess, because I hadn’t done it for a while. Klaue’s arm is CGI, so I guess you still had a little bit of it. [Laughing] Yeah, exactly. A fifth of me is CGI, you’re right. Speaking of that, it’s really exciting to see War for the Planet of the Apes get a Visual Effects Oscar nomination. Oh yeah, it’s great. So thrilled for those guys, for the visual effects teams. It’s amazing. I’m curious about your thoughts on its awards recognition. Do you wish it had gotten recognized in more Oscar categories? Definitely. I do think in terms of performance, there are some extraordinary performances in it from Karin Konoval to Steve Zahn, who played Bad Ape. You know, Woody Harrelson in that was terrific too. I think it was overlooked, I have to say, and I’m very biased because it’s a film that’s very close to my heart. I do think that Matt [Reeves]‘s direction and storytelling and what that film means and is, I think was given short shrift really. I think it’s an important movie, really. So I’m very glad that the visual effects are at least being honored, but I do think so, yeah. Critically it was so well received as a great piece of film and storytelling. Right. Well do you think motion-capture performances could be recognized in awards acting categories eventually? Oh yeah, definitely. I think this year there’s been ... I mean, the Academy is openly, they’ve written emails to the acting branch saying we have to now acknowledge performance in the broadest sense. So performance-capture, voice talent acting. And they’re asking the question: What is the epitome or the essence of a great performance? It doesn’t just have to mean seeing an actor’s face on screen. It can be manifested using performance-capture. So they’re absolutely on top of it. I think they see it as important as other areas of diversity, so there isn’t prejudice against a particular type of acting. So I think we’ll see in the future, hopefully, people like Doug Jones in The Shape of Water. They’re widening the remit. Otherwise these performances get overlooked. There’s going to be a new Lord of the Rings TV series from Amazon. Do you have any plans to return for it? Oh gosh, I have no idea what that’s about, really. I mean, it sounds incredible, but I don’t see myself being any part of it. I don’t think they would – I think it’s a completely fresh, new approach to it all, so I don’t think I’d imagine myself to be anywhere near it really. I guess we’ve seen most of Gollum’s backstory in the films. Pretty much, I would think. Things have been quiet around the Tintin sequel for a while now. Is there a chance it will actually happen in the future? Oh I’d love that to happen. I’m not sure if there is a possibility at the moment. I know there has been talk and Peter Jackson I know has been wanting to make his version, his Tintin story for a long time. I guess we’ll have to wait and see on that, there’s nothing confirmed or anything. I saw Breathe last fall, and you’ve got Mowgli coming up. It must be exciting to be directing blockbusters now. Yes, exactly. In fact, I started on what was called Jungle Book, but now is called Mowgli well before Breathe. The post-production on it has been so long. But I’m very excited about it, it’s really really coming together now. We’re in the final stages now of putting a film together, and it’ll be out this fall.